If you use Google to search for [do a barrel roll] in Chrome, Safari or Firefox, you'll notice that the search results page actually does that. 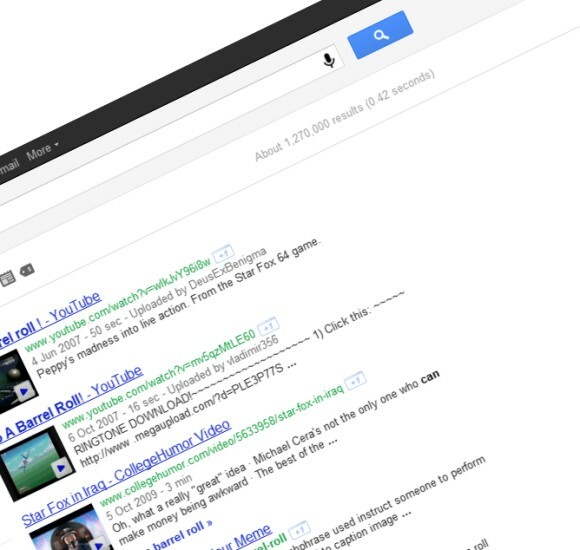 It's a brilliant Easter Egg that will surprise a lot of Google users. According to Wikipedia, "a barrel roll is an aerial maneuver in which an airplane makes a complete rotation on its longitudinal axis while following a helical path, approximately maintaining its original direction." There are at least four other Google search Easter Eggs: ASCII art, anagram, recursion and tilt. Works in Safari as well. I have no anti-anything running in the background. I'm using Firefox 4.0.01. It doesn't work for me. What am I missing? It works in Firefox 7. I can't get it to work on IE9 either - what am I doing wrong? This truly is awful "music". However, we should always try to find a positive or learn a lesson and here is what I take away. Parents: Please do not praise your kids for every silly thing they do and tell them how unique and creative they are when, they are in fact, not. Push, encourage to do better, teach, instruct, etc and when it's time, be realistic. This is an album made by people who's parents should have encouraged them to get real jobs. search for "do androids dream of electric sheep". google instant will load the results for "do a barrel roll" (and therefore trigger the barrel roll) as soon as you type "do a". There were a lot of hoaxes, April fool’s pranks and several other practical jokes that Google played on their more "gullible" users! I don't have any issues with loading. Work well for me. it is work fine, no issues recorded yet!